LabArt Peg Boards provided by Total Lab Solutions, are injection molded from (High Density PP) recycled polypropylene for structural rigidity, lighter weight and ease of assembly. LabArt peg boards or drying racks are easy to clean, environmentally friendly and eliminates secondary contamination to hanging glassware. This uniquely designed pegboard is currently available in both Black and Platinum Gray with pearl gray pegs. To further increase design options, other board sizes and colors for peg boards/pegs will be available upon request based on minimum order requirements and mold changes. 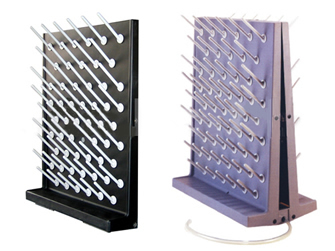 TECHNICAL: LabArt Peg Boards feature high mobility and design flexibility. All pegs are front side mounted and positioned at a 40 degree upright angle and are removable by lifting upward on the face of the board for cleaning or repositioning of pegs to accommodate larger glassware. The load capacity of each peg is 15.4 lbs or 7 kg. Each pegboard has a pre-molded drip tray for directing liquids easily and quickly to the drain hose and sink for disposal. The first is a back to back system for bench mounting and the second and more universally used is a single system for wall mounting. Each board is accompanied by mounting brackets or connecting brackets for stability for hanging purposes. Packaging: Four units per carton; 78 x 36 x 59 cm; 22.5 KGS / carton, minimum order one complete carton. Minimum quantity of 1,000 units is required for mold and production changes for OEM private labeling or logos.